Netflix is aiming to fill half of its streaming catalog with original programming over the next few years, according to company CFO David Wells (via Variety). The announcement marks a renewed push towards offering original TV shows and movies commissioned by Netflix over stocking licensed content. 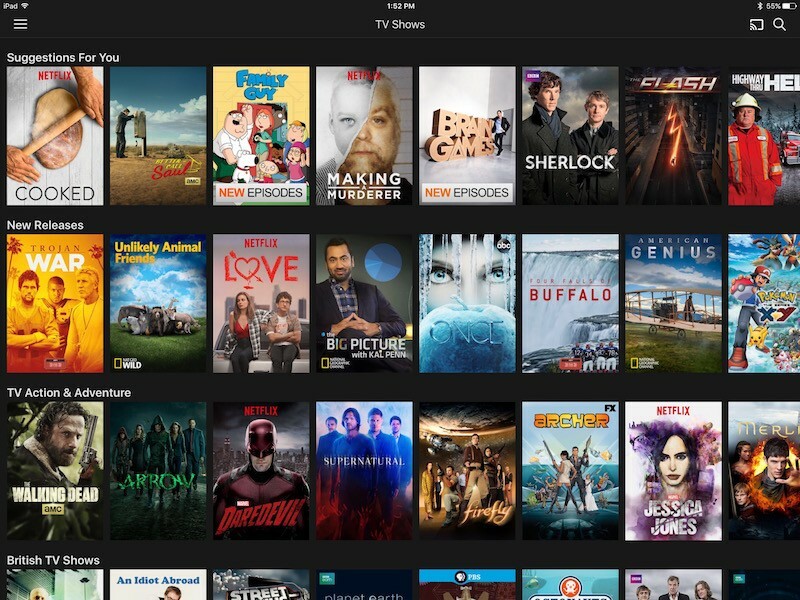 The streaming catalog is already one third of the way toward reaching the target, according Wells, who said the company was undergoing "a multiyear transition and evolution toward more of our own content". Netflix expects to launch 600 hours of programming in 2016, up from 450 hours in 2015, said content chief Ted Sarandos at the start of the year. The company has projected content spending on a profit/loss basis to rise from $5 billion in 2016 to more than $6 billion in 2017. Wells said the original TV series and movies will continue to be a mix of content owned and produced by Netflix, as well as co-productions and acquisitions. The streaming market is seeing a decreasing cost of production and an increasing number of bidders, making it cheaper to take risks on new programming. "You have supply and demand settling out," Wells continued. "We don't necessarily have to have home runs. We can also live with singles, doubles and triples especially commensurate with their cost." The goal, he said, is to release something that appeals to each individual subscriber, every single month, and on that front "we’ve got a ways to go" across different genres and formats. "The nice thing about the platform is it allows a lot of creative freedom," Wells added, offering the production of episodes of varying lengths as an example. Netflix is in the process of transitioning all U.S. subscribers to its standard $9.99 monthly plan, which it says will help generate revenue for investing in original content. However, the forced switch increases the price for some older subs by $2 per month and has led to higher cancellation rates than the company anticipated. Netflix reported a lower-than-expected 160,000 net U.S. streaming subs for the second quarter. A follow-up season of Stranger Things, one of Netflix's most recent breakout hit shows, has already been confirmed. On August 31, the company renewed the series for a second season of nine episodes, to be released in 2017. While their shows are great, this has the potential for another company to swoop in and take customers away. Many people aren't interested in their shows and are looking for a cheap way to watch content without a cable subscription. Their shows are the cherry on top, not the cake. If Netflix significantly cuts the rest of their content, I may drop them. I'm sure Cue is regretting not bidding on Netflix now. Their original content is wonderful. Expect good things. I don't like the shift in business. For Netflix, I'm sure it's good, and don't get me wrong, they pump out some good original content. That's not why I originally signed up for Netflix, though (back when it was DVDs in the mail). I want a streaming service that actually has all the new movie releases from all major studios. I'd consider paying $20/mo for it, because I watch a lot of movies. I also hate this practice of studios now letting you buy a digital movie on release day, but having to wait 2+ weeks to rent it. This is so infuriating and backwards. Two weeks prior, your movie was in the cheap theater and I could go for $2 to see it on the big screen. Now my only legal option is to pay $20 to own the film, or wait a couple weeks and rent it for $6? Netflix seems to do well with a season or two of original shows. But is there an example of a series actually continuing to be good after season 2? Or even season 1 in some cases? Narcos is rubbish in season 2, House of cards went downhill at season 3, Orange is the New black was poor after season 1. To each their own, but I thought OITNB peaked during Season 4, and I'd hardly call Narcos S2 'rubbish'. Personally, I'm thrilled with this news. A few years ago I might've been on the fence, but Netflix Original is generally a mark of quality nowadays. How is it so cheap as it is? It's an amazing deal. Very happy with Netflix. There are LOTS of movies that only have Danish subtitles, and no others. English movies, mind you. Even if they have English subs in other Netflix regions. I'm confused. You want English subtitles for English-language shows? In the USA I watch ALL shows with Closed Captioning enabled to get around the "mumbling" problem. Doesn't that address your problem? More cancellations than they expected but I bet quite a few of those come back before long. There just aren't alternatives with as much available, especially not at that price. I just hope this announcement just means more original content, not significantly cutting back on movies and especially TV.